Apparently, animals really can roam freely at the Lion Park Reserve, a PAAZAB-accredited sanctuary near Johannesburg, South Africa. 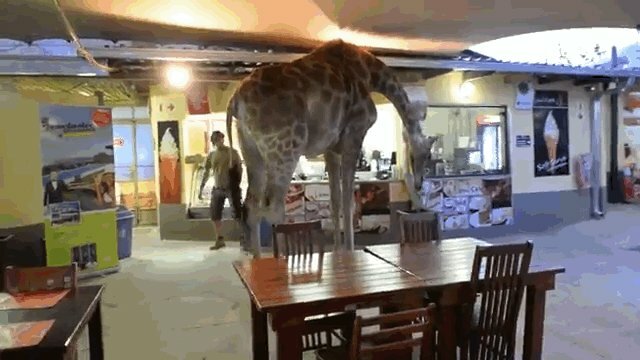 Recently surfaced footage shows one of the reserve's giraffes, Perdy, taking a lunch break inside the complex's food court, where park visitors were surprised to find the massive herbivore. According to onlookers' reports, Perdy did not seem anxious to be around people, though the giraffe did have to duck its head to fit comfortably inside the restaurant. After a few moments of exploring the restaurant, Perdy casually trotted back outside to rejoin the other animals.